BESTEK Power Inverter Brand A portable designed power inverter with high performance to power up multiple loads and major household appliances on the go. Manufactured to provide to be the best with superior quality parts and professional customer service for end-users. Product Specification AC Output (3 AC outlets accumulative): 200W Rated, 250W Max , 500W Peak Input Voltage: 12V DC, Output voltage: 110V~120V USB Output: DC 5V, 4.2A rated (4 USB ports accumulative) Indicator: Green-operation, Red-shutdown Over Voltage Shutdown: DC 15V-16V, Low Voltage Shutdown: DC 10V-11V Built-in Fuse: 30A/32V Optimal Use and Precautions : For DC12V and Car ONLY, not applied for DC 24V and airplane use. Fan operates depending on temperature and load. The fan is a little loud when you turn the switch on, BUT you can use all USB ports WITHOUT turning the switch on. When charging your iPad or large device, please use the 2.1A USB port and keep the other USB port free. Please understand your device wattage. Caution! do not use high power electric devices such as hair dryers, electric heaters, curling iron and etc. Not recommended to use for a long time when vehicle is not running. 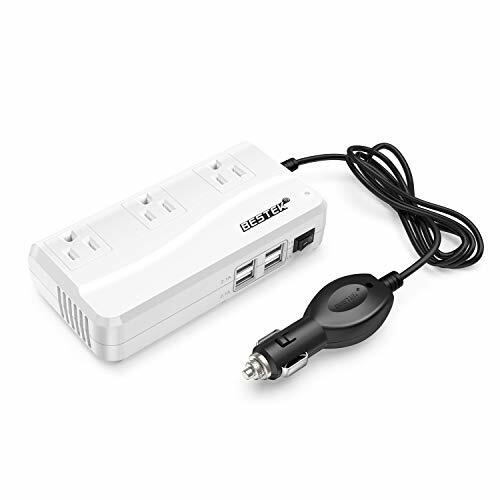 Package List : 1 x Power Inverter 1 x Cigar Plug Cord 1 x User Manual Good to know: With 18 Months Warranty and Provide Friendly, Easy-to-Reach Support.